I tried to search for a user using the query displayname = “Bob Jones”, but all I got back was the error message The attribute with path ‘displayname’ does not exist. The displayname attribute doesn’t exist?!? For more information on letting casing and when it matters, see Attribute Names. I tried searching for all the users who live in the state of Oregon, but all I got back was the error message Some fields are not queryable: primaryAddress.stateAbbreviation. What does that mean? But what do you do if you need to search on the primaryAddress.stateAbbreviation attribute? Here’s your answer: contact your Akamai representative and ask him or her to index the attribute for you. For more information on indexed attributes, see What You Can Search On. I tried searching for all the users who have Gmail accounts by using this query: email = “*@gmail.com”. All I got back was the error message Some fields are not reverse-queryable: email. What’s the problem here? The problem here is this: in order to use a wildcard character at the beginning of a string, the attribute you are searching on (in this case, email) must be configured as a reverse-queryable attribute. (Which, for our purposes, simply means that you can use a wildcard at the beginning of a search value that references that attribute.) To have an attribute marked as reverse-queryable, contact your Akamai representative. For more information on wildcards and how they can (and cannot) be used in the Console, see Wildcard Characters. I tried searching for all the user accounts created on or after September 25, 2017 using this query: created>= “9/25/2017”, but I got the error message Invalid date string ‘9/25/2017’: expected ISO8601 format. Did I do something wrong? For more information about searching for dates in the Console, see Searching for Datetime Values. I tried searching for a user using the query uuid = “834-962*”, but all I got back was the error message Invalid UUID string “834-962*”: Expected hexadecimal UUID string. Why did I get this error message? For more information on wildcard characters, see Wildcard Characters. 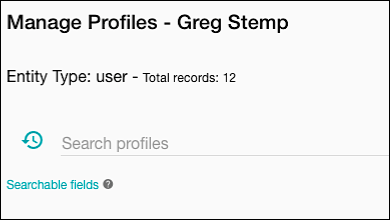 I want to look at all my user profiles. I tried using the query displayName = “*” but all I got back was an Invalid string %: cannot begin and end with a wildcard error message. How do I display all my user accounts? Select the query created> “2017-09-25” and then press Delete. 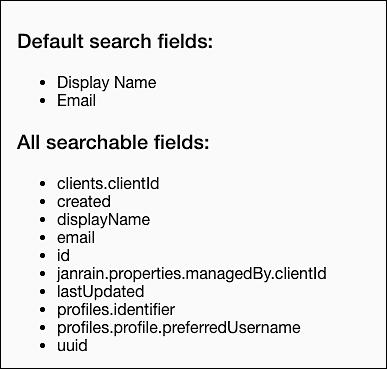 As soon as the query is deleted the screen will refresh, and all your user accounts will be displayed. 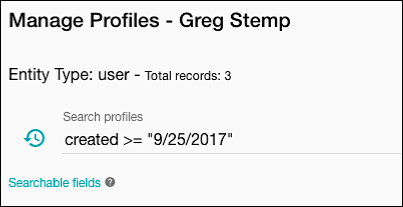 I searched for all the user profiles created after September 25, 2017 (that is, September 26 or later) by using the query created> “2017-09-25”. However, the returned results include users whose profiles were created on September 25. Why? Effectively, that refers to the exact instance at which the date clicked over to September 25th. Any date or time later than that (including, for example, a time one second into September 25th) is greater than your specified date. That returns the data you’re looking for. For more information on searching for datetime values in the Console, see Searching for Datetime Values.